Remove fresh cranberry beans from pods. Place the beans in a medium sauce pot and cover with chicken stock. Add a bay leaf, and braise until tender on low heat for about an hour. When tender, add one teaspoon salt and let stand in liquid until ready to serve. At this time, preheat your grill or BBQ to medium high. Wash and cut squash into quarters so they will be easy to grill. Toss with olive oil, salt, fresh pepper, fresh thyme sprigs, smashed garlic cloves. Place squash on grill and cook for two minutes on each side. Set aside. Morel mushrooms tend to collect a lot of soil, so wash them thoroughly; you might have to rinse them a couple of times. If you are using dried mushrooms, soak them for 20 minutes then rinse two more times. Let dry on a towel. Cut morels in rings, trimming off the end. In a large sauté pan sweat one- quarter cup of shallots in three tablespoons of butter for two minutes on medium heat. Then add the morel mushrooms and cook for three minutes, then deglaze the pan with one cup of white wine. Cook for five minutes then add one cup of chicken stock and cook for ten minutes or until the liquid reaches a sauce consistency. Add salt and fresh pepper. 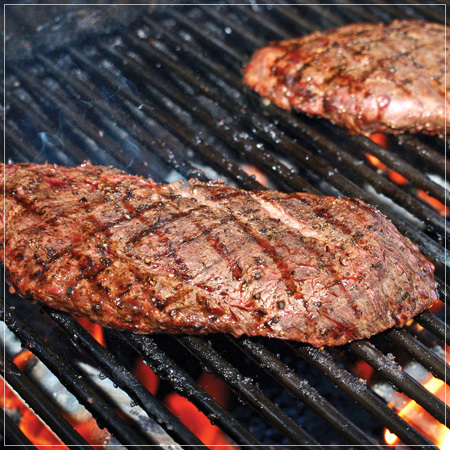 Prepare the flat iron steak 20 minutes before you’re ready to grill, bringing it up to room temperature. Drizzle with olive oil, season with salt and fresh pepper. Grill for five minutes, then rotate the steak a quarter turn and grill for two more minutes, then flip and do the same on the other side. Remove the steak from the grill and let it rest in a warm area for five minutes before slicing. Finish the beans by straining off the liquid and tossing with three tablespoons butter, salt, pepper, fresh chopped parsley, and chopped chives. Warm four dinner plates and spoon some of the cranberry beans on each plate. Then place some of the summer squash down followed by three slices of steak. Top with the morel sauce. Enjoy with a glass of Far Niente Cabernet.